Toy with tropes? Subvert expectations? Did we see the same film? I found its storytelling ham-handed and elliptical, struggling to find its meaning and message. But Rachel’s hardly the only person who sees meaning in what I see as clumsiness. Is this just a matter of different peoples’ minds seeing different patterns in the same content? The Force Awakens contained a lot of beats that seemed lifted from the original Star Wars, and The Last Jedi drew some comparison to The Empire Strikes Back, which perhaps leads people to conclude that the next film will evoke Return of the Jedi, and in particular an expectation that the trilogy is going to wrap things up in a fairly conclusive manner. After all not only did Jedi do so, but there’s likely still a lot of fanthink that these three movies are going to finish off the 9-film arc that George Lucas had teased decades ago. But it’s pretty clear to me that Disney has strayed far from that path already, since Force and Last Jedi build upon, but don’t really continue, the arc of the six Lucas films. So what if the goal here is to not evoke the closure of Return of the Jedi? What if the endpoint is instead to have our heroes suffer a crushing and total defeat, as happened at the end of the prequel trilogy? After all, we didn’t really “get to” experience the shock of the heroes utterly losing in the prequel trilogy, because we all knew it was coming, but this is an opportunity to surprise and shock the viewers. We went to see Star Wars: The Last Jedi this week. I see this is the third consecutive Star Wars film in which I led with wondering whether I have enough to say about it to be worth writing a review, so I think I won’t lead with that this time, and instead just jump to the spoilers (after the cut). Star Wars (9/10): Engaging, evocative setting, enjoyable characters. Despite its derivative roots and difficult gestation, the novelty and exuberance of what made it to the screen is still admirable almost 40 years later. The Empire Strikes Back (8/10): Better written, better dialogue, better-delineated characters, better special effects. Doesn’t really have an ending (since it’s the first half of a two-film story) and doesn’t have the gosh-wow factor of the first film. Rogue One (8/10): Extremely well produced, satisfying (if a bit depressing) story, effective backstory to the first film. Return of the Jedi (6/10): The opening sequence is excellent, Luke’s story arc comes to a satisfying conclusion. However, the Ewoks are somewhat annoying, the revelation about Luke’s family is utterly ridiculous, and geez, didn’t we already see a Death Star? The Force Awakens (6/10): Too self-consciously a rehash of the plot of the first film, too much of the setting that doesn’t make sense (is the Resistance part of the new Republic? Why are they operating like the Rebellion was?). Still, Finn is a great down-to-earth (or wherever) protagonist, the dialogue and action sequences are great, and seeing the original cast is fun. Revenge of the Sith (2/10): The only actor who gets out of the prequels not having his acting skills obliterated by Lucas’ direction is Ewan McGregor. Which arguably qualifies him as one of the greatest actors of all time, even before considering his uncanny embodiment of Alec Guinness. Attack of the Clones (2/10): This film is better than the next one on this list, and that’s all I have to say about it. The Phantom Menace (1/10): This film was completely unnecessary. Even the title is unnecessary. You have to work really hard to be a film with any production values at all and still earn a 1/10. I started to write a piece about where the Star Wars franchise collapsed under its own weight, but it turns out I wrote such a piece two years ago. I think at this point one must come to Star Wars expecting action, special effects, and witty dialogue, and anything more is gravy. That’s mostly what Return of the Jedi was, and the later films, including the new Disney ones, are in that vein as well. I definitely do not come to them expecting deep philosophical themes or interesting world-building, since the franchise gave up on any hope of coherently working out its timeline, universe, or fantastic phenomena decades ago. But that’s okay; there are worse sources of mindless entertainment. After all, this formula has worked for James Bond for over 50 years. We saw Rogue One on Wednesday, and I thought I didn’t have enough to say about it to be worth writing a review (certainly not as much to say as John Scalzi had), but after a little discussion on Facebook I think I do have a few things to say. But after the jump, as there are spoilers. We finally went to see Star Wars: The Force Awakens today. It’s fun! Action-packed. Great special effects. And Max Von Sydow! But it’s by no means a perfect film. I wonder if it’s even worth reviewing a Star Wars film, because historically they’ve been either fun-but-not-very-deep, or utter crap. But I’m not going to let that stop me, so: Spoilers ahoy! The first Captain America film was my favorite superhero film to date, but its sequel, The Winter Soldier, has been getting great reviews, and finally we were able to go see it today. I saw the original Star Wars when it first came out in the theater. I was 8. Years later my Dad told me that his reaction to the Imperial ship that appears in the first scene was that “it just kept going on and on.” To me, it didn’t seem like anything special. Wasn’t this how science fiction was supposed to be? Star Wars is the first great triumph of action and visuals over story. In that way it’s truly the film that separates the movies that preceded it from the movies that followed it. This is not to say there’s nothing else to it: There’s plenty of fine acting (alongside some truly terrible acting) – some of it perhaps all the more fine because they manage to turn some pretty awful dialogue into memorable lines and scenes. For all his flaws – on ample display in the prequel films – George Lucas hits the right notes in both writing and direction: The visuals are not quite up to 2001 standards (we’d have to wait for The Empire Strikes Back for that), but they’re still impressive for the era. The pacing is just right, moving the story along to keep getting back to the action and dialogue; despite that, there’s plenty of room for the setting to breathe, perhaps only getting bogged down in the Mos Eisley sequence. The extra footage in the special edition – especially the Han/Jabba sequence – is completely superfluous and was correctly left on the cutting room floor. I think it’s fair to take everything in the original film at face value, and indeed one of the film’s strengths is that it suggests a lot without digging into it. There’s a rebellion against the Empire which has just won its first major victory. Leia is a princess of Alderaan whose father is backing the rebellion. Luke’s father was killed by Darth Vader when he was a boy. There’s no reason to believe Luke, Leia and Vader are related. I’m never sure what to think of Lucas claiming to have been influenced by Joseph Campbell’s The Power of Myth; does it really matter? Storytelling is storytelling, and the film’s visceral impact, as far as the story goes, has more to do with the colorful characters, and the fact that Luke is so readily identifiable by the viewer as the hero. (Luke’s whininess early in the film is often mocked, but it’s essential to making him someone we feel for. I also generally reject claims that Lucas had much of anything beyond the first film planned out ahead of time. Much like J.K. Rowling’s claims decades later of having concocted the entire Harry Potter arc up-front, it feels like after-the-fact rationalization (or mythologicization), trying to fit the tap-dancing after the property became big into a bigger framework. I think fans of these franchises are too willing to believe that the creators had a grand plan which they neatly executed. I think it’s all hogwash. Nonetheless, Star Wars is a story of redemption, just not of Luke redeeming the sins of his father Anakin. Rather, in the first movie Obi-Wan meets the son of the man who died because he failed to train Vader appropriately, and he sees the opportunity to give Luke the ability to avenge his father and follow his dream of fighting for the rebellion. Luke is redeeming Obi-Wan. Obi-Wan even gives up his life to afford Luke this opportunity. While Star Wars is the story of a boy becoming a man, The Empire Strikes Back is the story of that man learning that the reality behind his boyhood dreams is much darker and more serious than he’d believed. It’s an adult story with adults doing adult things (I didn’t appreciate the interplay between Han and Leia when I was 11, but it’s one of the best parts of the film to me as an adult.) It’s a much better crafted film than the first one, with fewer of the storytelling glitches that we were cheerfully overlooking the first time around. (To my mind the biggest glitch is a subtle one: The Leia/Han story thread appears to take place over a few days – maybe a couple of weeks once they get to the cloud city, while Luke seems to spend months – maybe even a year – on Dagobah being trained by Yoda.) It doesn’t quite have the thrill of the first film, and of course it ends on a down note. I vacillate between the two films and which one I like more. Unfortunately Empire was also the start of the cracks in the franchise. The main in-story crack is the revelation that Vader is Luke’s father. When I first saw the film, I felt this was a stretch. But maybe they could pull it off. Maybe Obi-Wan didn’t know, that he’d been tricked or something, or maybe there was something even more sinister going on. Or maybe Vader was just lying – he’s the villain, of course he could be lying. Given the way things played out, the revelation was a short-term shock was ended up being a story disaster. They should have just gone with “Vader was lying”. Outside the story was the indication of how marketing and merchandising was going to disrupt the franchise. I remember the action figures being highly desirable at the time, and the Boba Fett action figure was given heavy promotion. I didn’t understand it at the time (remember, I was 11) – why should I care about this character I hadn’t even seen yet? And then he had a negligible role in the film. In hindsight, this was one of the early signs of Lucasfilm and its allies making a big cash grab. Boba Fett was a disposable character who didn’t even look very cool, but he was hyped up to make some money. This was the future of the franchise. As far as I’m concerned, Return of the Jedi was functionally the end of the franchise. Indeed, after the opening sequence where Han is rescued – which may be the single best set-piece in the whole series – the film starts going downhill and then picks up speed. Actually the film starts off on a low point, with the creatively-bankrupt introduction of a second Death Star. Lucas was pretty clearly out of ideas, and consequently the film’s best sequence is just the payoff of the cliffhanger from the previous film. From there we have way too many made-up aliens, ridiculously complicated space battles, Ewoks (which should have been Wookees), and of course the ludicrous revelation that Luke and Leia are siblings (thus undercutting most of the dramatic tension of the protagonist’s romance). As a series of fight scenes, Jedi is decent enough, but as the capstone of a three-part story, it’s a mess. Around that time there were rumors that Lucas was planning to do a 9-episode arc, filming the three prequel films next, and then three more films afterwards. I remember reading how old the actors would be if they continued to release a film every 3 years – by 2001, Alec Guinness would be 87 years old (in fact he died in 2000). After the disappointment of Jedi (particularly in contrast to the tremendously rewarding Star Trek II: The Wrath of Khan the year before), it was kind of a relief at the time to learn there would be no more Star Wars films. The term “jumping the shark” hadn’t been coined yet, but the franchise had pretty clearly done it – really, it had just barely limped to the finish line under the collective weight of its implausible backstory and increasingly-grandiose special effects. Ultimately, the series would have done better to have disposed of the shocking revelations and just focused on straightforward action and suspense. In the early 90s, Dark Horse Comics got the license to produce Star Wars comics (the largely-forgettable Marvel Comics series having been cancelled a few years earlier). At the time Star Wars felt like an enjoyable childhood adventure film, but did anyone really care 10 years after the last film enough to buy any comic books? Apparently they did. 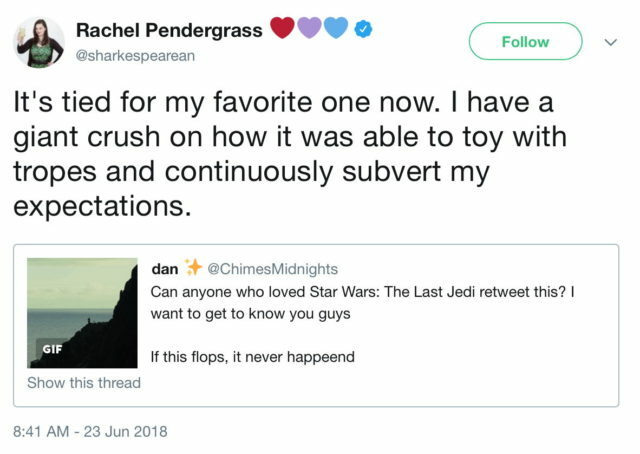 I wondered a few years later of this was the leading edge of Lucasfilms getting Star Wars back in the public consciousness in advance of the prequel series. (Now, 20 years later, Disney owns both Marvel Comics and Lucasfilm, and is pulling the license back from Dark Horse.) The “special edition” versions of the original trilogy came out not long after, with their newer-technology special effects that stripped some of the charm from the original films. I have little to say about the prequels. I was moderately enthusiastic about The Phantom Menace, but it was godawful. I wasn’t very excited about the next two, and indeed all three are basically forgettable. They’re not even like some recent action films where there are a few good scenes worth watching if you turn in on TV at the right time – they’re just soulless and bad. Over time, I’m less and less a fan of “franchises”. It feels like most of the DC and Marvel comic book characters are long past their sell-by date. These days Superman and Batman feel more like parodies of their original (or their most popular) incarnations. Star Wars seems no different. I often wonder what keeps its fans enthused about the franchise, but I guess I just don’t understand since I think he franchise has had negligible entertainment value since Return of the Jedi. I really have very little interest in the about-to-start-filming Episode VII. Though based on Star Trek Into Darkness, it seems likely that J.J. Abrams should be able to follow the “series of action set-pieces with limited story content” formula. I also secretly hope that Mark Hamill will speak all of his lines in the voice of The Joker. Watching the original film, as I have been while typing this, it still stands up as an entertaining action film, with snappy dialogue and a little heart. But compared to the Star Wars franchise today, it also feels like it was made a long time ago, in a galaxy far far away. Before I saw Star Trek Into Darkness I saw someone sum up the film as “A fun film. Not a good film, but fun.” While I tried to avoid learning too much about it before seeing it, I learned things here and there, and was not encouraged by what I’d learned. Finally I saw it last weekend, and I’d say it’s certainly not a good film, but it has its fun moments. It also drags in places, and the screenplay is a complete disaster of plot, pacing and characterization. It’s certainly a big step down from 2009’s Star Trek (which has grown on me since I originally saw it). Critics gushed over The Dark Knight, I think not entirely justifiably. While Heath Ledger’s performance was a revelation, the script was a little weak, full of gimmicks and with a disappointing climax. On reflection, I think it fundamentally suffers because its theme – the one imparted by its antagonist, the Joker – is one of nihilism. While nihilism can be used effectively as a contrast to the protagonist, The Dark Knight left me feeling a bit like the Joker had won. Contrast this with Batman Begins, which is all about the protagonist finding the meaning in his life, and which has an entirely satisfying conclusion. The Dark Knight Rises concludes the trilogy, but its opening sequences seem to push The Dark Knight even more to the side: Rather than Batman (Christian Bale) continuing to work against crime from outside the system, he’s retired, and Bruce Wayne has become a recluse. Harvey Dent’s death and Batman’s sacrifice (taking the rap for Dent’s death) lead to a golden age in Gotham City, as the Dent Act puts criminals away for years, at only the cost of Commissioner Gordon’s soul (Gary Oldman), maintaining the lie. Truly, it seems the Joker beat Batman (because why would the Joker care of a bunch of criminals get put away?). Eight years after the events of the previous film, cat burglar Selina Kyle (Anne Hathaway) breaks into the private wing of Wayne Manor, setting in motion events which turn Gotham upside-down. The mysterious criminal Bane (Tom Hardy) has his sights set on the city, bringing Batman out of retirement for a showdown. While also a long film, I felt that Rises moves right along with few slow periods (few times that I was willing to go to the bathroom, for instance). It’s got secrets (who is Bane? Why is he gunning for Gotham? ), humor (especially in Batman getting back in the saddle), some tense fights, and characters set low and then fighting to their catharsis. It’s properly a sequel to the first film, with the second just being set-up, and the story is, ultimately, better than either of its predecessors. It ought to hold up on re-watching, too.